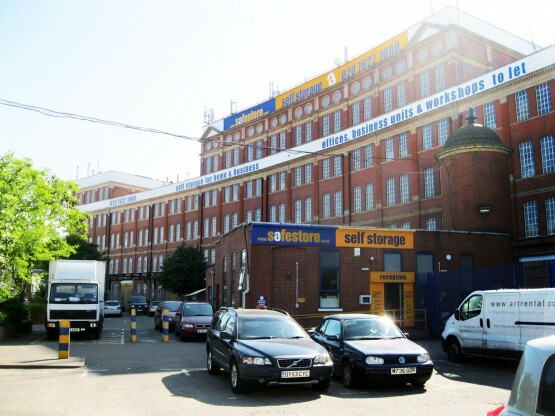 The Safestore self storage facility is located in Battersea in south London and was originally constructed as a depository in 1901. Following the successful completion of external repairs to two other Safestore sites in Islington and Edgware, we were awarded the 21 week contract for the repairs and refurbishment of the front, rear, flank ends and internal structural elements together with waterproofing to the roof. Due to the close proximity of the railway line at the rear of the building and the requirement to keep the building in operation with as short a programme as possible, a combination of scaffold fans, temporary suspended electric cradles and abseil techniques were used to access the facades. The faces of damaged brickwork were repaired using Remmers colour matched Restoration Mortar and where severely damaged, individual matching bricks were replaced. Cracks were repaired by resin injection and installation of Helifix HeliBar, helical bar reinforcement, followed by extensive brickwork repointing. New movement joints were created in external solid walls by cutting vertically and then installing horizontal sleeved HeliBars across the newly formed joints. The joints were then completed by sealing with a polysulphide mastic. The reinstatement of the details to the damaged dressed stonework was also carried out by ‘dubbing’ with a polymer-modified, structural repair mortar and completed using the appropriate Remmers colour matched mortar. Rendered bands were decorated using external grade masonry paint. Concrete repairs were carried out within the penthouse structure using Fosroc Renderoc, pre-bagged, lightweight repair mortar, where soffits had failed due to the expansive corrosion of the buried filler joists, caused by long-term water ingress through the failed roof covering above. To prevent further water penetration from the roof, Sika LPL’s Decothane System, a glass fibre reinforced liquid roof membrane, was applied to the roof areas. Once completed a Single Point Guarantee, provided by the manufacturer, was issued to the client providing assurances they required for the building’s continued serviceability. Whilst the above works were being carried out the client also took advantage of having the steel framed windows refurbished and fully redecorated and any broken glass replaced.